Experience this tremendous recipe from Copperleaf Restaurant & Bar: mouthwatering Kodiak Island Halibut served with Yakima Valley Asparagus, Spring Onions and Lemon Thyme. Do you think you have what it takes to master this recipe? Let us know how your version turned out! Start with a sauté pan large enough that you can put four pieces of fish in and are not touching each other or the sides of the pan. Heat your pan on high and add enough olive oil to coat the bottom of the pan with an even layer. Once the pan is hot, you will see wisp’s of white smoke coming from the pan, season the fish on all sides with salt and place carefully in the pan, avoiding any oil splashing. Turn the heat down to medium and let them cook on one side until golden brown. To check the coloring on the fish carefully use a flexible metal spatula to lightly raise one corner and peek at the doneness. Once golden, carefully flip fish over and add butter put in oven for approximately 3 minutes or until the fish feels slightly firm on its sides. Start by snapping bottoms off by holding just below the tip of the asparagus with one hand and the base in the other and lightly bending until it snaps. Next, peel outside off of asparagus leaving the tip fully intact (Optional). Securely tie the asparagus together in one bunch with butchers twine. Remove asparagus from water when it is fork tender, and place directly into ice water, leave in cold water until fully cool, approximately 5 minutes. In warm sauté pan, add 1 tablespoon olive oil and sauté onions until golden brown. Add your blanched asparagus, butter, shallots, garlic, parsley and thyme and season with salt and pepper. 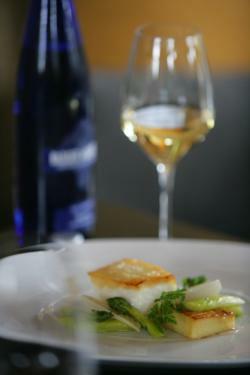 To serve, spoon your onion and asparagus garnish onto a plate and place fish on top. A fresh squeeze of lemon and olive oil to finish and enjoy!